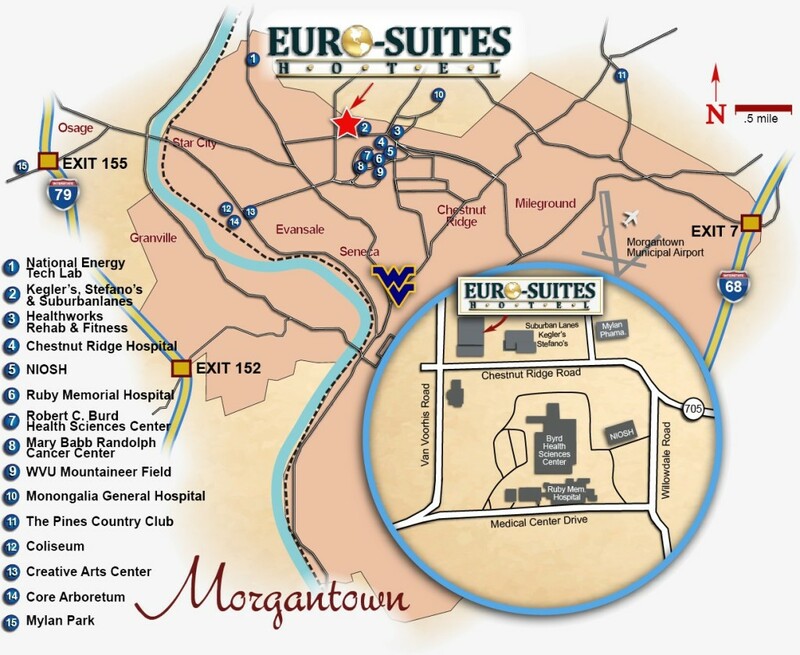 The Euro-Suites Hotel is an independently owned hotel nestled in the scenic rolling hills of Morgantown, WV. This hotel is adjacent to numerous restaurants including Kegler’s Sports Bar and Stefano’s offering our guests two wonderful dining options as well as providing onsite catering options for Euro-Suites groups. Our convenient location puts you within walking distance to shopping, corporate businesses, downtown Morgantown, Mylan Pharmaceuticals, West Virginia University, the WVU Football Stadium, NIOSH, Ruby Memorial Hospital and Monongalia General Hospital. The hotels complimentary shuttle service gives you easy access to these points of interest and our local airport. Our two-room suites are comfortably furnished featuring in-room kitchenettes with coffee makers, refrigerators, microwaves, irons and ironing boards, and complimentary high speed/wireless internet access. We offer a complimentary deluxe continental breakfast daily, including a waffle station. The lounge is a favorite spot for hotel guests who want to ease in to the evening. The Euro-Suites Hotel is the perfect location for corporate and extended stay guests, families, social groups and teams. We look forward to seeing you soon! Experience ‘All Suite’ living at a one-room price!